UD faculty and Delaware teachers are collaborating to integrate computer science principles into public school curriculum. 11:25 a.m., July 3, 2013--Although computers are an integral part of daily life and critical to the functioning of modern society, only nine states nationwide are counting computer science (CS) courses as a core requirement in K-12 education, according to a report released by the Association for Computing Machinery. Currently, the state of Delaware counts CS courses as an elective. The findings of the report were cited by Lori Pollock, professor in the University of Delaware’s Department of Computer and Information Sciences, as she addressed Delaware middle and high school teachers at the start of the Partner 4CS workshop held June 24-28 at Memorial Hall. The workshop was sponsored under the CS10K Project, a National Science Foundation funded project that aims to enhance the rigor of computing courses in 10,000 schools taught by 10,000 well-trained teachers through knowledge-based partnerships. 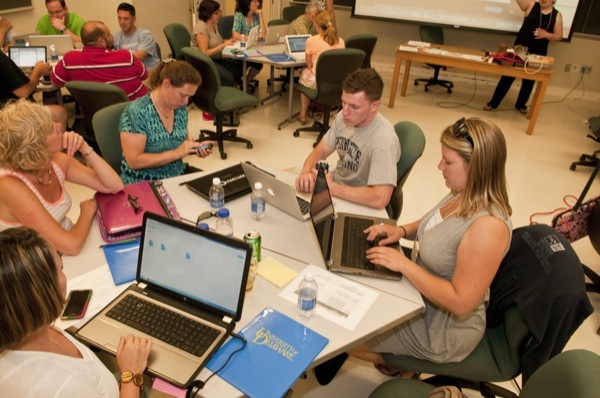 In an effort to implement an enhanced CS curriculum in Delaware and surrounding states, local teachers worked with UD computer and information sciences faculty to learn how to integrate CS principles, concepts, lesson planning and pedagogy into their classrooms. Terrence Harvey, associate professor of computer and information sciences at UD, said Delaware teachers recognize how important CS is to their students’ education and will have to convince their school administrators to add the curriculum to their current lessons. “There’s no extra time in a school day, so if we put computer science in, what’s going to come out? The answer is that these computer science lessons have to incorporate math, biology, physics, chemistry, or whatever it is that the students will already be learning,” said Harvey. To help do that, the teachers were encouraged to see that many of the lessons they teach already contain opportunities for significant computational thinking. In addition, they were introduced to Scratch, an educational programming language that allows students to create games, simulations, animated stories, interactive art, music and more. Michael Wisniewski, an eighth grade math instructor at Newark Charter School for 10 years, said the workshop helps teachers stay on the cutting edge of teaching methods and tools. 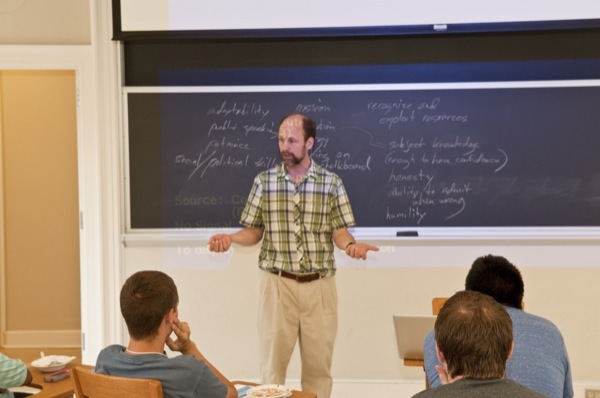 Integrating computer science principles into lessons will train students in critical thinking and logic skills, and to make connections, which Wisniewski said he believes needs to be emphasized in all subjects. “With programming, the computer only does what you tell it to do, so you have to be very clear with your algorithms, which gets students thinking logically, and I think that’s the biggest thing from this conference that I will take back to my math classes,” he said. Another key component of the workshop is to provide teachers and counselors with strategies to attract and recruit students, particularly traditionally under-represented groups, such as girls, to the field. Chrystalla Mouza, UD associate professor of instructional technology in the School of Education and a co-investigator of the NSF grant, said increasing female interest involves informing them of the wide-range of career opportunities available and breaking the CS stereotype of individuals working in isolation. The educators are also equipped with knowledge of how computer science is relevant in solving societal problems. “We know that girls are more likely to get involved with computing when they use it in a larger societal context. Also, the computing tools we use, such as Scratch, are a great venue for supportive creative work, and are likely to be appealing to girls,” Mouza said. In order for computer science to become an integral part of grade school education, Mouza said the most important step to take is to continue to increase teacher learning and offer professional development. Additionally, she said building a community of teachers who integrate CS into their curricula can become part of a national movement that will put increased attention on developing computational thinking among students. If that can be accomplished, and all students have early access to programming languages such as Scratch, it “will help build 21st century skills in problem solving, creative thinking and innovation” among students, Mouza said.